Summer is back! The moment we think of the scorching heat, not many of us would really want to step out of our dwellings. Read on to know what can keep your energy high to enjoy the season. Bottoms up: It is always important to drink plenty of water for proper hydration. Water intake needs special attention in the summer. Try keeping a bottle of water with a few ice cubes in it with you whenever you go out in the summer so that you will always have something to drink. Drinking Green tea is also a good option in summers, as green tea increases the metabolism and accelerates the fat burning process in the body and is packed with antioxidants such as polyphenols and flavonoids, which are known to boost the immunity system and protects us against cough and flu. Wear loose cotton clothes: Cotton absorbs the sweat from your body and allows it to evaporate into the air. It keeps you cool and prevents infection. Avoid synthetic fabrics in summer because unlike cotton and other natural fabrics, most synthetic fabrics do not breathe. Wear light colors like white, yellow, beige and other light shades keep you cool because they reflect most of the sun’s rays back into the atmosphere. Summer is the best to treat with some interesting fruits and vegetables. It is best to include a mix of in-season colorful veggies and fruits in your daily meals, for example, rainbow salad, etc. Onions also are great in the summer, because of their ability to beat the heat and provide relief from summer ailments. When we wake up in the morning after good 8-hour sleep, our body needs food. The term 'breakfast' was derived from 'break the fast' - the concept where we eat after long hours of rest. Therefore, fuel yourself with a healthy breakfast with proteins, carbs and healthy fat that help to boost our metabolism and keep us active throughout the day. Go for a swim: The body loses heat in water much quicker than it loses heat in the air. Taking a dip will cool you down rapidly. If you are swimming out in the sun, do not forget to apply sunscreen to prevent a painful sunburn. 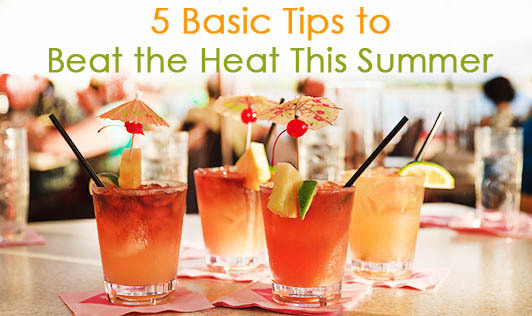 These tips may seem like small changes, but they can add up to a cooler and safer summer.